Benefits of Aqua Therapy on Juvenile Arthritis | Swim Spas OH - Leisure Time Warehouse | Hot Tubs, Swim Spas, and Pools. Ohio's Best Dealer! We think of arthritis as a disorder that afflicts the older populations. But juvenile arthritis is an inflammation of the joints that can affect children and teens under the age of 16. There’s different types and levels of the affliction, but pain in the joints and chronic inflammation is the key. There’s plenty of ways to treat it but aqua therapy is one way to supplement treatment and alleviate pain. There’s been actual scientific studies done on the positive effects of aqua therapy in a swim spa or pool for juvenile arthritis patients. Or, at the very least, deemed it a positive exercise program for patients. There’s plenty of exercises out there to help any and all joint pain. Aqua therapy allows those with limited mobility and strength to accomplish exercise without harming themselves. There are some great exercises available for young sufferers of arthritis. This is a fairly straightforward exercise and can be a great sort of cardio for patients with pain in any of the joints in their legs. The water resistance as a level of intensity without putting undone stress or weight on the joints of the legs. Using a pool noodle, form a U putting your foot at the center of the noodle and pushing out. Then raise this leg and hold it as long as you can. This is a great core exercise that doesn’t put stress on the lower body. It’s also a great stretch for the tendons and ligaments in your legs. People swear by planks, but for patients with arthritis in the elbows or wrists, this can be a painful and near impossible exercise. There’s a way to accomplish this in a pool, however, pushing down on a noddle with your elbows until it submergers and holding yourself on the surface. You get the benefits of the plank without stressing the joints in your arms and shoulders. What Exactly Does Aqua Therapy Entail? Aqua therapy isn’t just doing exercises in a pool. While it’s true you can do it on your own, it’s true a form of physical therapy designed to strengthen you over time. For that reason we recommend seeking out a professional facility to begin an aqua therapy program for you or your teen. It’s also important to maintain safety in the pool while performing these exercises and a professional facility can offer that. Having a home swim spa or pool will provide immense physical benefits once you have a good understanding of your aqua therapy program. What Other Conditions Does Aqua Therapy Help? Aqua therapy offers benefits for a wide range of disorders and conditions. Chronic pain can be helped, as can injuries, tendonitis, recovery from immobilizing breaks, and other physical ailments. Stress and anxiety, common problems for teens, can also be helped by physical work in the pool. Aqua therapy can help the young and old for various problems and ailments. But make sure to do research, consult with a doctor, and seek out a professional and licensed facility to begin an Aqua therapy program. Having a home swim spa or pool to continue your therapy at home provides immeasurable benefits. LeisureTime Warehouse serving the Cleveland area can help you pick the perfect swim spa to meet your needs. We carry premium brands that offer quality, features, and performance. Our goal is to cater to your desires as well as stay within your budget. We carry luxury brands such as Michael Phelps and H2X. As well as premium brand hot tubs and affordable swimming pools. 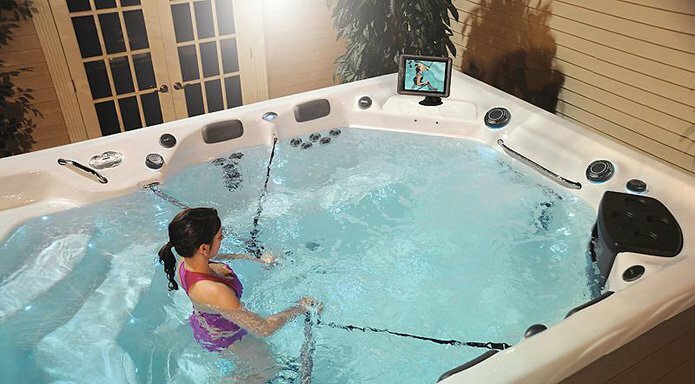 Come visit us and browse a wide selection of swim spas and hot tubs. Our sales professionals are happy to help you pick the perfect one to meet your needs. Contact us today to learn more with a Free consultation!